Creamy, light peanut butter dip perfect on top of celery or in a mini phyllo cup. 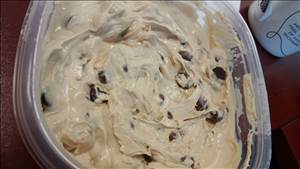 Mix all ingredients and then stir in chocolate chips. Put on top of celery, phyllo, or any low car snack. There are 48 calories in 1 serving of Peanut Butter Dip. Calorie break-down: 28% fat, 45% carbs, 27% protein.